Say, I never tried this – or even considered it. I assumed Micarta, like canned vegetables and detective novels, only came from giant factories in China. But M. Silvius is far more adventurous than I. Well thank you so much for the plug Joel. Glad you found the post interesting. 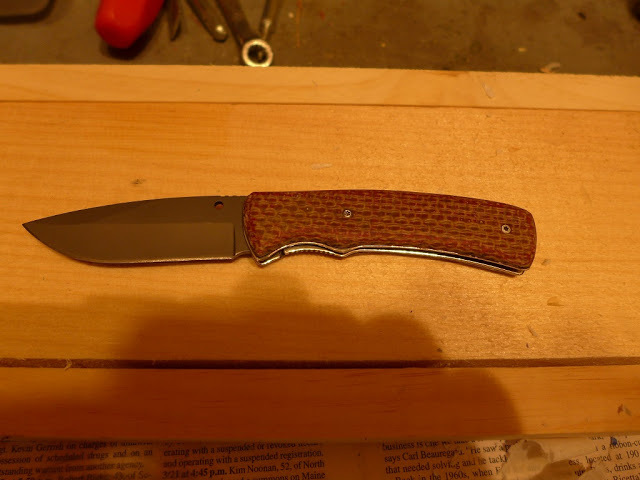 I have since made a second set of scales in brown and tan layered fabric for another one of those cheap wally-world knives. Need to post a picture of it . The next venture will be making some new grips for a STAR BM 9mm using the same method. Hey, that’s cool. I had thought of micarta as being some fnaglled industrial process. Now I want to give it a try. I have lots of old fabric around here, and lots of clamps. Epoxy is pretty cheap, especially in bulk.